Given the scope of the 15th International docomomo Conference — “Metamorphosis. The Continuity of Change”, which took place at Cankarjev Dom (by Edvard Ravnikar, 1960–1980), in Ljubljana, Slovenia, on 28-31 August 2018, this subject is definitely on the docomomo agenda. 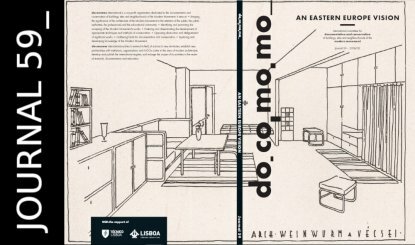 The theme of this 59th docomomo Journal challenges us to reinterpret the modern architecture of Eastern Europe. During the last few years, authors and editors such as Philip Meuser  have been recounting a new history that includes the modern architectural legacy of former USSR and other Eastern European countries. The recently opened MoMA exhibition Toward a Concrete Utopia: Architecture in Yugoslavia, 1948–1980  and Ákos Moravansky’s (ed.) monograph trilogy East West Central: Re-building Europe , published last year, are some of the freshest contributions to this movement towards what one might call the rethinking of MoMo historiography. This DJ focuses on understanding the buildings, projects, personalities and phenomena located at this intersection of a world divided between the capitalist West and the socialist East. The dynamic of changing conditions in Eastern Europe countries contributed specific features to Modern Movement architecture and its local legacies. Bringing together narratives of scholars from the Czech Republic, Hungary, Serbia, Slovakia and Slovenia, this collection of texts is an overview devoted to modern architecture in some of the countries of the former Eastern bloc. In this issue, diversified reflections are presented: from essays dedicated to collective habitare, such as housing blocks in the former Yugoslavia and Czechoslovakia, where the hotel typology is also explored; from WWII Memorials in Yugoslavia to interventions in emblematic public building, such as the intervention in the Slovak National Gallery and the restoration of the New Synagogue in Zilina; or the question of preserving industrial complexes in Slovenia. In Hungary, the historiography of post-war modern architecture is portrayed, and its inter-war architecture is also revisited in connection with the interpretation of the diffusion of the Modern Movement made by the local journal Tér és Forma. Finally, there is place for discussion about architects and their masterworks, as the Slovak architect Friedrich Weiwurm and the Slovenian architect Edvard Ravnikar. These examples of the Eastern European architectural avant-garde, often forgotten outside of the region for which were original designed, can now be brought to light and provoke new narratives. It is expected that coverage of these pioneering approaches will be further extended to abroader geographical area in a later DJ issue.docomomo is grateful to Henrieta Moravcikova for accepting the challenge to be guest editor of this DJ, and the authors for generously having shared their research. Due to their commitment and meticulous work, it is possible to present this Journal, which addresses the legacy of Eastern Europe architecture and its future. 1. Exhibition Stanko Kristl, the Architect, Humanity and Space (curators: Tadej Glažar, Tina Gregoric, Maja Vardjan), MAO Museum, Ljubljana, Slovenia, 19 December 2018-30 September 2018. 2 Matevž Celik, “Foreword”, in Stanko Kristl, arhitekt. Humanost in prostor/ Stanko Kristl, architect. Humanity and Space, Ljubljana, MAO, 2018. Janez Kresal, Edo Mihevc – Izbrana Dela, Ljubljana, MAO, 2016. 3 Philip Meuser and Dimitrij Zadorin, Towards a Typology of Soviet Mass Housing: Prefabrication in the USSR 1955–1991, Berlin, DOM Publishers, 2016; Philip Meuser, Seismic Modernism: Architecture and Housing in Soviet Tashkent, Berlin, DOM Publishers, 2016. 4 Exhibition Toward a Concrete Utopia: Architecture in Yugoslavia, MoMA, New York, US, MoMA, 10 July 2018 – 13 January 2019 (see p. 88). 5 Ákos Moravánszky, Torsten Lange, Judith Hopfengärtner, Karl Kegler (ed. ), East West Central: Re-building Europe 1950-1990, Basel, Birkhauser Architecture, 2016.